Living in Winter Haven, Florida, Steve got a new lease on life 4 years ago through the grace of God, and ever since, he’s been sharing his faith with others whenever he can. 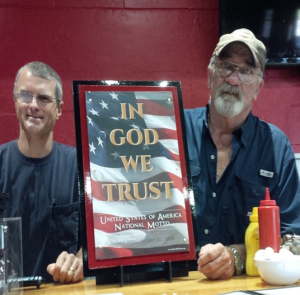 “When I saw the ‘In God We Trust’ posters offered by the CPCF,” he said, “I knew I could use them as a catalyst to start a conversation.” Steve uses the posters to create beautiful mounted displays, and gives them as gifts to his neighbors and to local businesses. He’s already given away nearly 30 of them. “’In God We Trust’ is such a vital part of our country,” Steve said. “It’s such a blessing to see these posters open conversations between owners and employees, friends, neighbors, and especially veterans.” Steve’s not alone in his passion for our national motto. Almost 3 million people are proudly displaying ‘In God We Trust’ in their homes, businesses, schools, and government buildings across America.